If you haven’t heard, The Fordham Observer, Fordham College at Lincoln Center’s only university-sanctioned undergraduate student newspaper for the past 35 years, is in trouble. On April 21, the department of Communication and Media Studies announced to The Observer’s editorial board via an email from Jacqueline Reich, CMS’s chair, that it had decided to cease academic support to the paper effective May 21. CMS cancelled all the credit-bearing Observer-affiliated journalism workshops planned for the Fall 2016 semester, leaving the paper’s staff without advisors – typically CMS professors who have professional journalism experience – and without the opportunity to earn academic credit for Observer-related work. While The Observer’s editorial board was notified of CMS’s decision, one constituency – arguably the most important – was not: its readers, who rely on the award–winning paper for campus news. Deeming this news unnewsworthy, The Observer (for which I have written several times) failed to investigate or even file a report on the decision in its own right. On June 25 – more than two months after CMS’s decision – the paper did, however, publish a simple write-up of the correspondence among concerned alumni, the CMS department and the dean of FCLC. 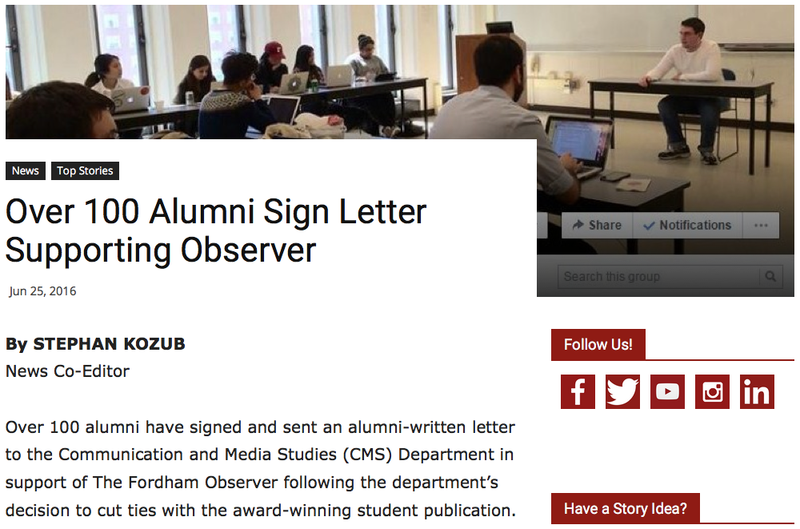 The report, written by news co-editor Stephan Kozub, rather than investigating why CMS decided to cut ties with The Observer, instead focused on a letter sent to CMS signed by 115 Fordham alumni in support of The Observer. Over 100 alumni have signed and sent an alumni-written letter to the Communication and Media Studies (CMS) Department in support of The Fordham Observer following the department’s decision to cut ties with the award-winning student publication. The clause in bold – “following the department’s decision to cut ties with the award-winning student publication” – should be the big news. But because The Observer had previously relegated this decision to the category of Better Left Unreported, it reduced the information to dependent clause status, a common tactic among corporate media outlets to downplay the significance of something. It’s a journalism phenomena colloquially referred to as beating around the bush: reporting on something in a roundabout way with the assumption that readers already know about what is indirectly being referred to. (A prime example, which I have written about before, is how The New York Times doesn’t report on most victories of the Boycott, Divestment, and Sanctions (BDS) movement, but rather tries to frame the momentum in the context of anti-Semitism and how Zionists on college campuses are “offended” and “traumatized” by criticisms of the Israeli government.) In this case, The Observer avoided reporting on an administrative decision that threatens its longstanding academic structure and instead issued a write-up about alumni reactions to that decision, amounting to a grave disservice to its readers. It’s not until the second half of the fourth paragraph, following a quote from the alumni letter, when The Observer finally explains the implications of the CMS decision. In cutting ties with The Observer, CMS has also decided to cancel all journalism workshops affiliated with the newspaper scheduled for the Fall 2016 semester, according to an April 21 email from Reich. That information deserves a story of its own, one thoroughly and aggressively investigated. The Observer’s choice to level an important critique of the decision using a quote from an alumnus – in The Observer’s classic pseudo-objective milquetoast style of journalism in which one side says X and the other side says Y and that’s the end of the story – reveals a hesitancy on the part of the paper’s editorial board to unequivocally condemn the decision. Although an editorial would have been more potent and more appropriate, The Observer took the safe route at the expense of its readers. Regarding The Observer’s recent decisions, Ben Moore, editor-in-chief of The Observer, told me via email that the editorial board “decided that we would approach and report on the story from impartial angles, as it directly affects and actively involves our members.” Moore justifies his paper’s lack of initial reporting on the CMS decision by invoking the useful tenet of journalism that prevents journalists from improperly placing themselves at the center of the story. Although this journalistic practice usually serves a good purpose, sometimes reporters are the center of the story – most notably since the Obama administration has made it much more difficult for journalists to do their job by aggressively prosecuting their sources. CMS’s decision puts the entire Observer at the center of the story, so reporting it as such is responsible journalism. It is a journalist’s duty to hold those with most power accountable, even when – especially when – powerful people exercise their power in a way that harms journalists. Moore offered a further justification: “We have received support from many different constituents of the Fordham community, many of whom are well-briefed about our current circumstance.” Although it was clear in The Observer’s report on the alumni letter, this defense amounts to an admission that the paper assumed readers knew about the CMS decision. Of course some members of the Fordham community know what had happened; that’s inevitable. But they deserved at least an early confirmation from The Observer itself. Before the several stories of government surveillance broke, many Americans suspected their emails and phone calls were being tracked. Using the assumption that readers already know about something to justify not reporting on it undermines the significance of a paper like The New York Times or The Guardian publishing a report confirming the existence of surveillance programs – and the many reforms implemented as a result of this reporting. Journalists who use this excuse degrade their own job and diminish their influence in political debate. Readers deserve not only a comprehensive report of the CMS decision, but also a thorough explanation (read: apology) of The Observer‘s recent editorial decisions. This entry was tagged Fordham, Fordham Observer. Bookmark the permalink.